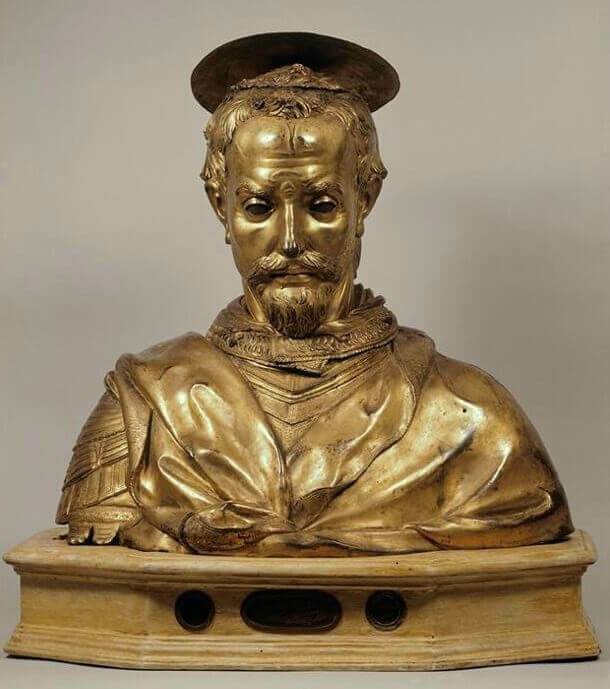 Completed between 1422 and 1427, the Reliquary Bust of Saint Rossore was commissioned by the monks of the Ognisanti in Florence, who had recently acquired the saint's skull reliquary (a container for holy relics.) Therefore, an appropriate outer casing was required to house the precious holy object. Saint Rossore was a Roman soldier, who had converted to Christianity and so was beheaded in Sardinia during Diocletian's reign in the third century AD. In contrast to contemporary reliquary busts, Donatello produced a piece that was much similar to ancient Roman portrait busts. It consists of five individual sections screwed together. Instead of an idealised and general viewed of the Christian martyr, Donatello offers a strikingly personal and individual portrait of a modern man. The clearly defined features have caused many to argue over the centuries that the gilded bronze bust is in fact a self portrait. The bust is notable for its acute attention to detail - there is even stubble on the face - all enhanced by the elaborate gilding, confirming the precious contents within.